It's Athina here with a little inspiration to get your weekend started! Today is the last day of February. Come on spring! I am ready to get out side and work in the garden, walk the dogs and just play around in the yard. Whose with me? Today I used an image that I have had colored for a while. It did not go with the original card very well, so I set it aside at the time. But today, I have the perfect use for little Oliver, The Greeting Farm - Lovey Dovey. 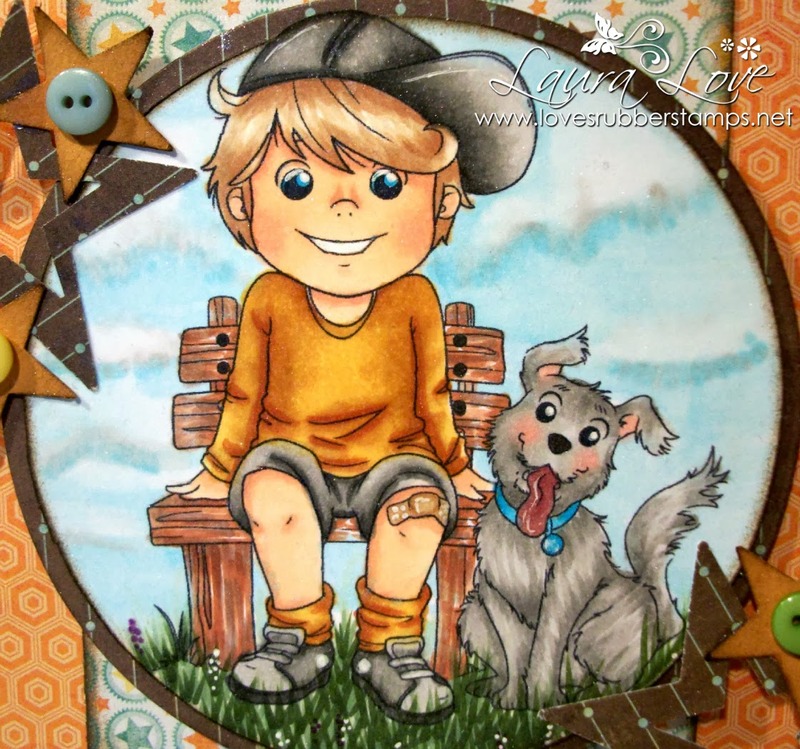 He is stamped with Memento Ink - Tuxedo Black and colored with Copics. I used My Minds Eye - Lost & Found Ruby for the background as it matched just perfectly! The sentiment goes perfect with this handsome little boy! 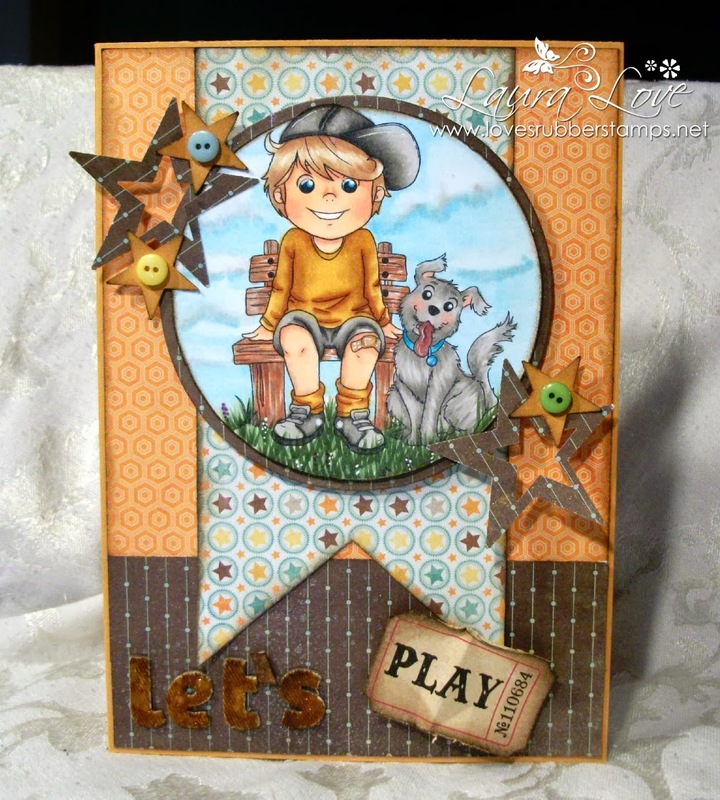 Keep in mind our challenge this week at Loves Rubberstamps, we want to see you use washi tape! Also make sure to check out the new items in the store. Laura has been teasing us with a bunch of fun new items to come. So make sure to keep your eyes peeled! Happy Holly-Day Monday! Today is my day to show you some inspiration. So I am show you a quick an easy sentiment card today. I just picked the paper and got out the dies and it whipped together in no time. It is no secret that I love the MFT Die-Namics because they are the perfect card size and they hold up to the challenge. Not only do I use them for myself, my friends also use them when we get together so they really withstand use after use. Those Fishtails are one of my fav and I love to have the layers one to stack up my layers. You still have a few hours left to join us in our Challenge - use a funny sentiment. Which my card does not depict because I need to send this to someone who has experienced a loss. Please join us tomorrow for our New Challenge as well. 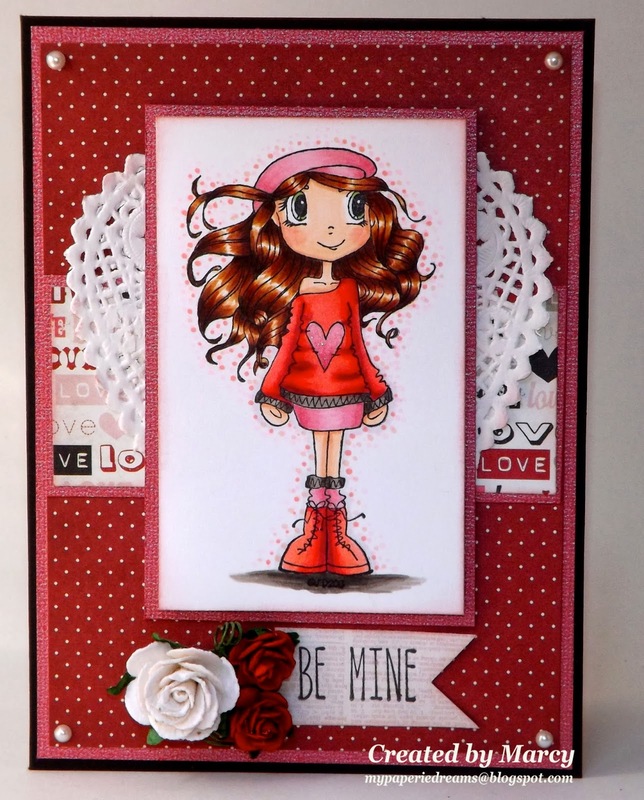 You also want to take a look through the Loves Rubberstamps Store, so many cute things and Laura has been adding to the New Items. As soon as I get done studying for tomorrow nights class, I am getting my Sugar Pea stamps inky! These are on preorder, so you may want to order one... a few.... okay, all of them are so stinkin cute! lol. 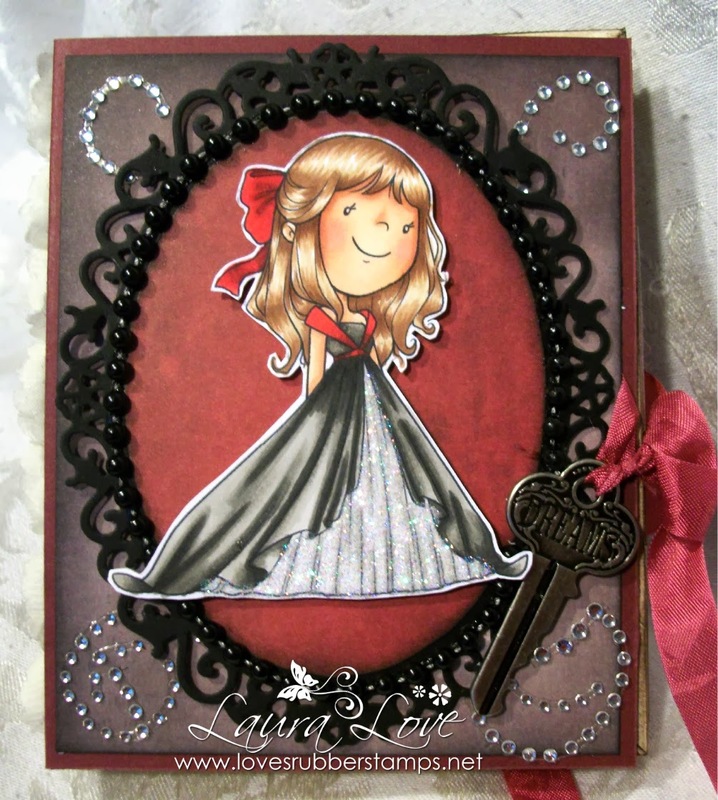 Laura is also adding the MFT's items that came out last month and she will add this release soon. It's so nice that you can come to the store and get as many different stamp companies and items as you want, all in one fell swoop for one shipping price or free if you spend $75.00! Hello Friends! It's Marcy here and I wanted to share a card with you all today! I hope everyone is having a wonderful weekend! This is a birthday card I made for a friend. I have quite a few birthdays coming up so I was happy to make one this weekend and add to my birthday card stash! 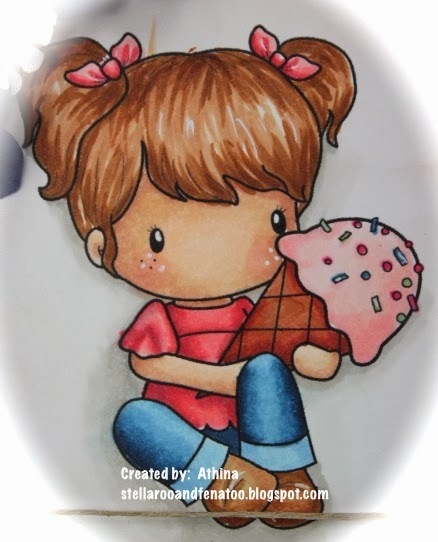 :) This sweet image is called "Wish Big" and is from the Pure Innocence collection by My Favorite Things. Isn't she so adorable?!! I just love fairies and this stamp set is so cute! I've had this sweet gal for some time and thought she would be fun to color up with my copic markers. I added some stickles in "Star Dust" to her wings, wand and shoes to give her some sparkle! 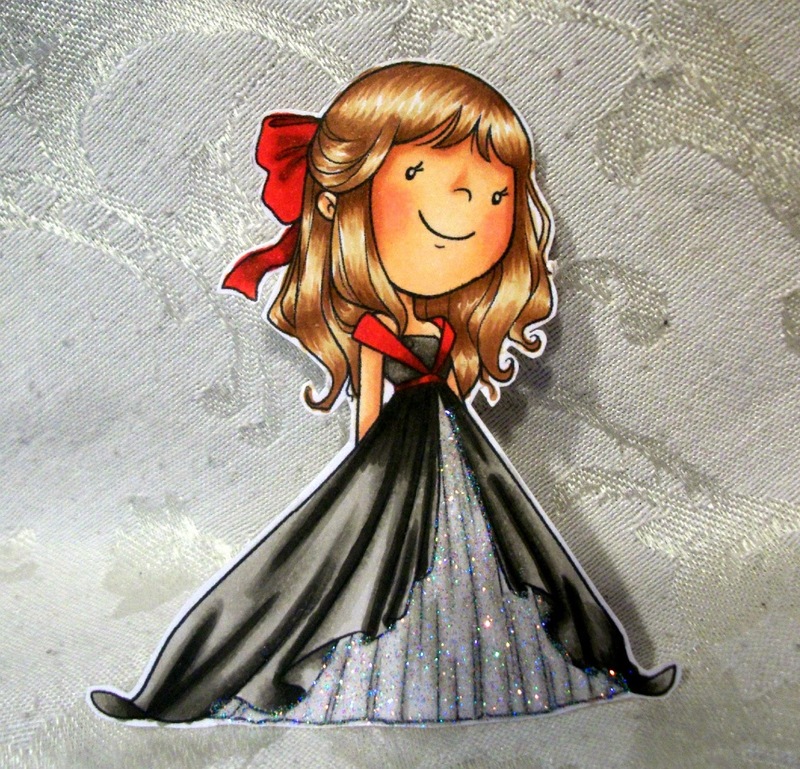 I also paper pieced her outfit with some fun papers called "Here and Now" by Echo Park. The pretty roses are from Wild Orchid Crafts. Be sure to stop by the Loves Rubberstamps store to see the items used on my card including a huge selection of Pure Innocence images to choose from! 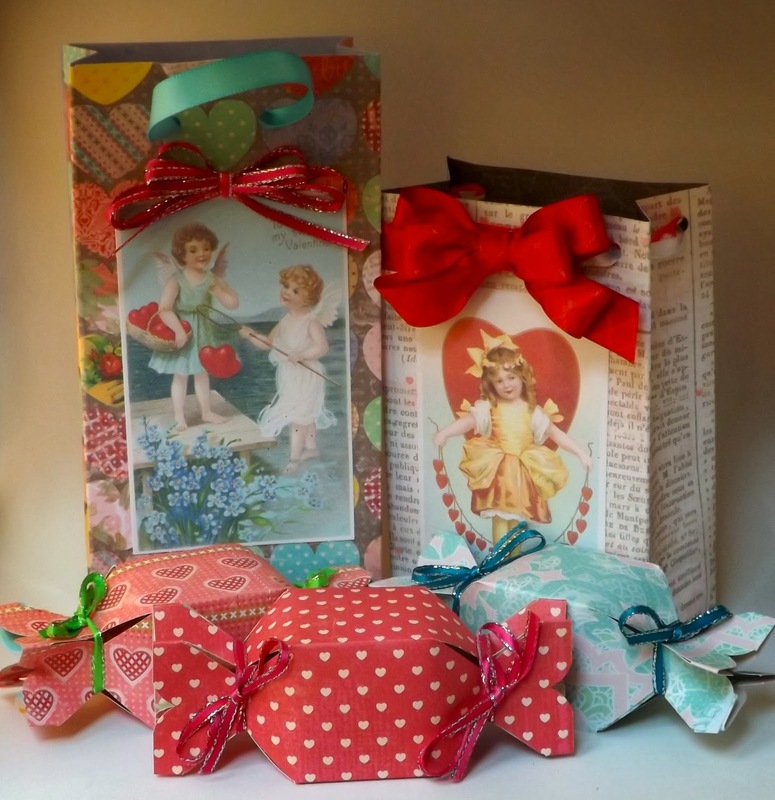 Also, make sure to come visit here tomorrow for the fun "Sensational Sunday" Blog hop! I loved coloring this image and creating this card. I love love love the lace at the bottom. I am not going to lie... I had no clue Hobby Lobby sold lace... of yes they do! I am sooooooooo sorry I do not remember what papers I used with this image. 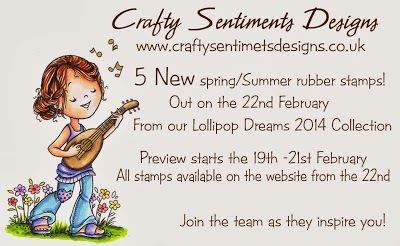 Today I have a cute SNEAK PEEK for you at one of the new release stamps coming from Crafty Sentiments Designs! Cut the cardstock for your cover at 5 1/4" x 9 1/2" and then score it at 4 1/4" and 5 1/4"
The Designer Paper for the cover is cut at 4" x 5"
The Designer Paper for the Spine and inside spine is cut at 3/4" x 5"
2 cardstock pieces that measure 4" x 10"
2 cardstock pieces that measure 5" x 10"
You are going to score all four of these every 1/2" to the very end. to use your bone folder between each fold to get nice, crisp folds. After you have the piece all folded - sponge the edges with ink if you wish. sliding them together so the pages alternate. Glue the outside flaps to hold the pages in place. until you have a full rectangle. 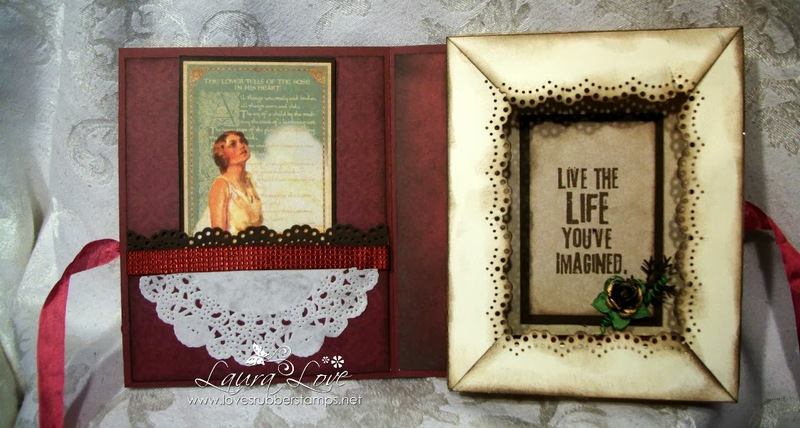 Place your decorated insert onto the inside back cover and then glue your book pages over it. 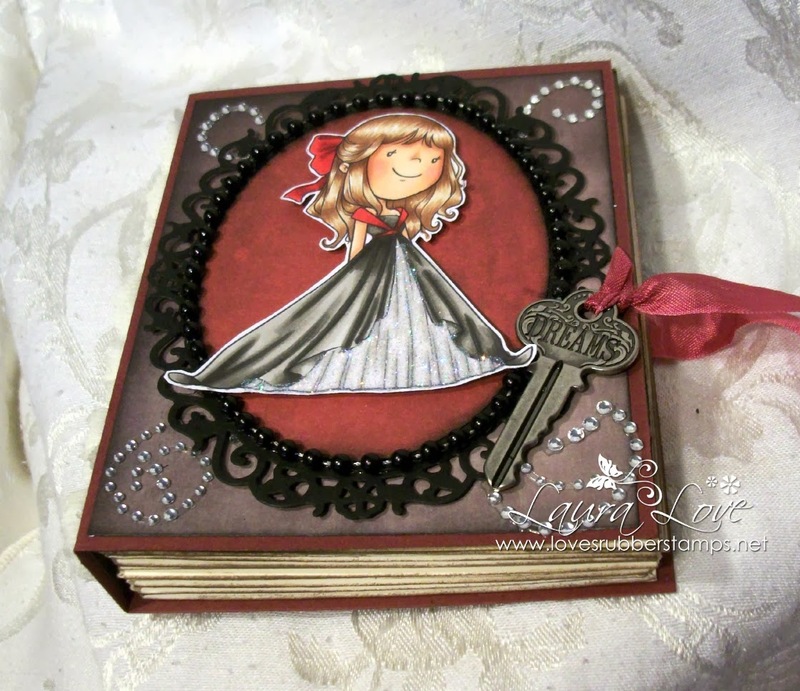 To create the decorated top of the pages, just cut strips of cardstock and punch one edge. Glue down on top of the book pages, miter the corners of the two top strips in you wish. Then just decorate as you want! Thanks for stopping by today! Be sure to visit the INSPIRATION BLOG and see MORE Sneak Peeks from the other Design Team Members!